This plea to have just a few minutes for ourselves is heard across every continent, country, state, town, and home in this world. This statement, however, has one unique quality to it: You rarely hear it uttered by men. Even very successful men will say, “I am really busy or I don’t have time,” but you will rarely hear “I just need some time for myself ” from a man. Most women are taught directly, or have the underlying message conveyed to us, that our purpose on this earth is to be a good daughter and sister, and to then go on to be a good spouse and mother. We are taught to be the glue that holds the family together and to create a happy home. In previous generations parents rarely encouraged their daughters to follow their dreams to become whatever they chose to be. Now, if they choose to be a housewife, CEO of a company, or an astronaut, it is perfectly acceptable, and they will be just as good if not better than their male counterparts. But still, the message is not to be one or the other. If you choose to work outside of the home you are still expected to be a good spouse and mother. Women do not get the hall pass that says, “But she is tired from working all day and therefore does not have to do the laundry, put dinner on the table, and make sure the children’s backpacks are packed for the next day.” It is expected that you will simply do it all. Let’s think about what happens with expectations. When we expect something from someone or something is expected from us, it puts stress or pressure on the other person or ourselves. These are the external demands placed by people who are outside of our physical body or demands we place on people outside of ourselves. If that is the case, then why is it that we as women feel the effects internally, within ourselves? I mean, that’s not the way it’s supposed to work, right? Unfortunately, that is exactly how it works. When you expect something from someone or something is expected from you, it actually produces a toxic response within your physical and emotional body. This goes for both women and men. Expectations are not gender based. However, interestingly, the response to placing them on someone or allowing them to be placed on you is very different in women when compared to men. In this situation where stress arises, we observe men and women handling the stress differently. “OM” is a very simple chant with a complex meaning. When chanted, the sound of the word OM is actually pronounced in three syllables as if spelled with the letters a, u, and m. OM is the whole universe encapsulated in a single sound and represents the union of mind, body, and spirit. When I was thinking about the intrinsic qualities of someone who flows through life successfully and makes it seem effortless, I noticed that these people are really in tune with all aspects of themselves: their body, mind, and spirit. They look healthy and have a glow about them. They are very sharp and quick to respond. They are also extremely aware of themselves and their actions. I then realized that these people have that special something that enabled their success. I coined it The OM Factor. Today, seventeen years later, I have in common with millions of other women the title of mother, CEO, sister, daughter, and wife. This art of balancing harmoniously all these roles and relationships, being holistic in our approach to our well-being, as well as being successful at whatever we do in the workplace and at home during most of our waking hours, is the OM Factor. But one thing I have realized is that what women tend not to share as a group is bringing the many aspects of our spirituality into our workplace—whether that work is in the office, home, or wherever we spend the majority of our time working. The presence of spirituality in the business world or in any institution is clearly important. I am not, of course, talking here about following a dogma of organized religion. 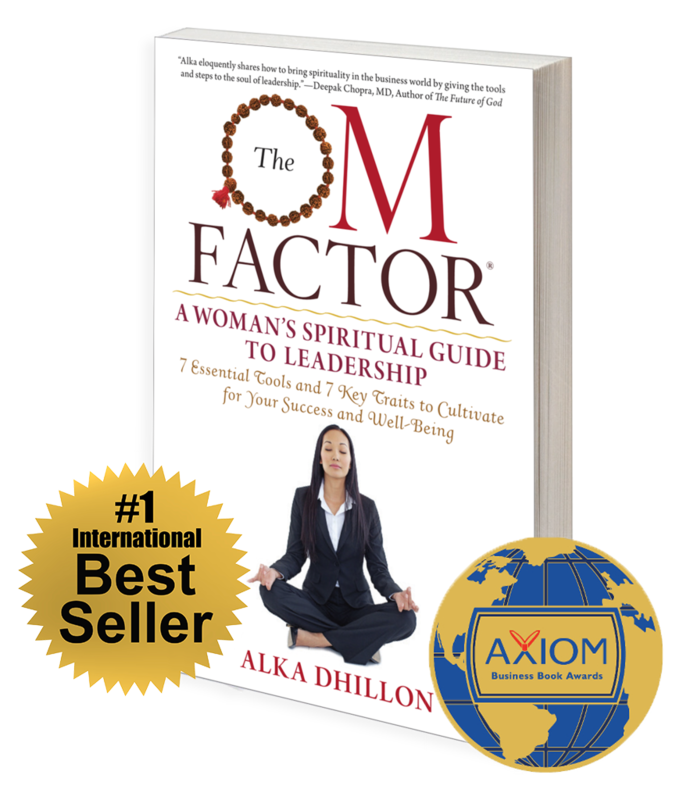 I am referring to true spirituality—having a path that guides and allows a person to discover the essence of his or her being by looking within, as demonstrated by successful women who have the OM Factor. It is my intention that what will unfold over the course of reading this book is that people will acquire a roadmap to discover not only what their own personal OM Factor is, but how to increase it in themselves and others around them. I have taken very common feelings that arise in our daily lives and provided practical and tangible ways in which to deal with them more spiritually, for people ultimately to become much more successful and happy. I have provided actual tools in part two that you can immediately use to handle these scenarios acutely and “in the moment.” In part three I demonstrate how to repair the root of the reason the situation became untenable and anxiety provoking in the first place by developing the spiritual traits that are key to being able to handle life’s curveballs, as well as reducing the frequency of them appearing in your life. You cannot heal a deep wound immediately. First, you need to deal with stopping the bleeding, and then you can address healing it at a deeper level and ideally preventing it from happening again in the future. If it does occur in the future you will know how to handle healing the wound in a manner that is not haphazard and chaotic, but rather holistic and tranquil. Those individuals who have the OM Factor (and a high one at that) are able to deal with challenging situations as they arise. They have learned to not react involuntarily to difficult situations but to intentionally respond to them, as I define and describe the differences between these two kinds of behavior in the following pages. These people flow. They are able to do this by constantly being very aware of their deep and direct connection to their source—their spirit. It is effortless for them because they are aware of who they are at the core, truly no different from anyone or anything around them. They are one with the universe. Spirit has no color, no shape or size. Spirit is universal. It is like air. We all breathe the same air; however, some of us breathe in quickly and some more slowly. It is the same with spirit. We all have it, but some of us are more aware and connected to it than others. The good news is, like breathing, it takes a millisecond to change your experience . . . fast or slow, awake or asleep. It is all in your control and all your choice: What is your OM Factor and what would you like it to be?